Why will you want to make friends with your competitors? I will tell you why, because no man is an island of his own. In chapter fourteen, I told you that I don't have competitors, all I have is business partners. That's what works for me, yours might be different, but I think you need some level of relationship with other pro bloggers, most especially those above you in the blogosphere. Building a relationship with blog visitors is much easier than building a relationship with other bloggers, your visitors sees you as possible solution to their problem, whereas your competitors see you as a possible cause of their low Alexa and Google rank. In any case, you seriously need to relate with them, Weather your relationship is symbiotic, commensal or even predation am not interested, all I know is that you have to blend with other successful and unsuccessful but talented bloggers. Getting the contact, time and attention of a pro blogger is not that easy, believe me, most especially when they are way above you, but I will tell you something, what every blogger wants is ideas that will improve their blog, pro bloggers inclusive, this is what you will use as a bait. In other to make this chapter straight forward and easy to accumulate, I will divide the topic into two parts. 1. The Importance of maintaining a beneficial relationship with other successful bloggers. 2. How to Build a Good Relationship with other Pro Bloggers. 1. 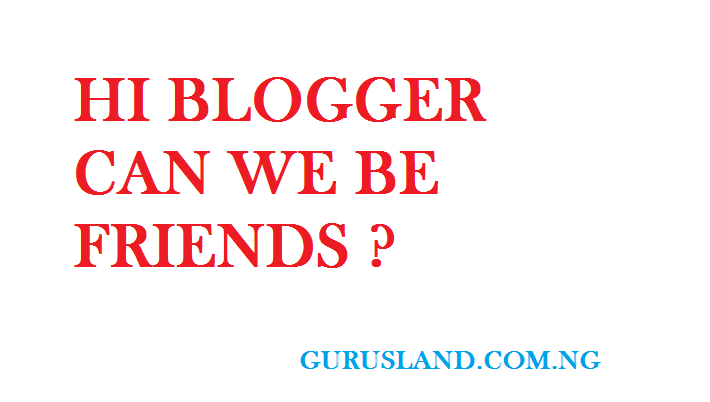 The Advantage of maintaining a beneficial relationship other successful bloggers. a. To exchange ideas and share experiences from successful and unsuccessful blog projects. b. To trade or exchange backlinks. c. To invite or be invited as a guest blogger. d. To spy on the internal workings of the blogger. e. To increase your connections and business networks. f. To participate in a combined blog project. g. He/she might introduce you to other great bloggers he already know. h. To get connected and know what's trending in your niche. There are disadvantages of having a working relationship with other pro bloggers, but believe me, the advantages is much greater than the disadvantages. All I can tell you is that you should beware of how far you go in revealing your unpublished blog projects to other bloggers, because it might be used against you, I have fallen victim to that once. In Addition, connecting your business partners and contributors to other pro bloggers is risky, am not saying you shouldn't, All Am saying is that you should play safe, don’t worry, with time you will come to understand fully all that am saying. These are stages you must pass through in your journey to becoming a successful blogger. Ask me of my connection with jackobian.com, I would say "we were school mates", ask me of my connection with xclusivetek.com, I would say "we were course mates", Ask me of my connection with Viviangist.com, I would say " We meet at BlogNigeria" , And so On. 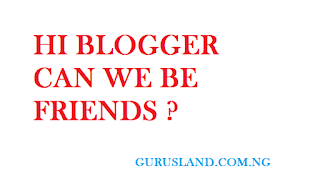 What do I mean by this, as you grow and improve as a blogger, it is natural to come in contact with other bloggers having similar interest as you, but sometimes you have to "force friendship" on some Influential Bloggers, for you to get what you want. What everybody blogger want is a positive idea that will help develop his/her blog. That's the problem with newbie bloggers, they always look to what they can get from a pro blogger without thinking of what he/she can contribute to Website of the pro blogger. "Hi, good day ma, please i will like you to add my blog link to your website, thanks for accepting my request". Believe me, even if such emails escape the spam folders and get to her inbox, she will definitely move it to junk folders without a second thought. There are steps to follow in other to gain a pro blogger’s time, trust and attention. 1. Write down the list of your targeted influential bloggers. About 10 of them to start with. 2. If you already have a means of contacting them, great! If not, visit the contact us page of their website to check if their dropped any information. But you are not to use it, just to get hold of it. If nothing is available there, no problems. 3. Be the good guy, Register in their blog if registration is available, try commenting on their recent posts without adding any links, if not it might look spammy, you have to make them notice you, ask questions concern the article they wrote to engage them in a conversation. 4. Subscribe to their newsletter. You can reply their newsletters with a "thank you", question or contribution. 5. Take your "good guy" style to their social media pages, recommend and rate them, re-tweet their posts, they will get a notification that you did so. Your aim is to get their attention. 6. Offer to write a post in contribution to their already written articles, you may or may not include your links in the article. 7. Write a positive post about them or their website in your blog, link to them and then tell them to come check it out, they will be sure to share it in their blog if it is nice, and that's a backlink for you. 8. Now that you have gained their trust and attention ask for their contributions and opinion when writing an article for you blog, acknowledge them in your article and tell them to check it out when you are done. 9. it’s not going to be easy, most especially for the bigger boys in the blogosphere, but your techniques and manner of approach will determine your success. 10. Not all of your encounter will be successful, some might not still care but others will. The most important factor that will determine your success is what you have to offer them, or what you can contribute to their blog, even though they are already successful, they still want to be better and that’s' where you will come in. Only when you have contributed positively to them, that's when you can ask anything from them, this is the summary of it all.